US 340 has its own page in the US Highway section. 1.25 mi. ; from MD 16 north to MD 343. Created sometime between 1966 and 1970, when MD 16 was rerouted south of Cambridge. This was a short loop off MD 14 at Kelly Rd. MD 342 · St. Augustine Rd. 2.82 mi. ; from MD 310 north to MD 213. 11.29 mi. ; from beginning of state maintenance east to US 50 in Cambridge. Once ran through center of Cambridge turning northeast on High Street, then east on Maryland Ave to US 50. Washington St between High and Race Streets was MD 551; east of Race St was part of MD 16. Current configuration along Washington St dates from between 1966-70. 2.16 mi. ; from MD 224 east to MD 6. This route was once the southernmost end of MD 224. It seems odd these days as 344 is closer to 224's northern end than anything. But way back when 224 went north all the way to the DC border. The changeover from 244 to 344 occurred sometime between 1955 and 1960. MD 224's current route south of current 344 had been designated MD 563. MD 344 was previously named Gilroy Rd. from indeterminate point in Cambridge east to current MD 331, Vienna. No longer assigned (decommissioned c. 1940), entire route now part of US 50. Prior to 1940, when the Choptank River bridge opened, what is now US 50 west of Vienna was designated MD 344. Its associated secret-obscure number was 750, so current 750 has nothing to do with current US 50 at all, just a very strange coincidence. Anyway, after 1940 this route became part of US 213, changing to US 50 in 1949.
from US 50 south to WV line. No longer assigned (decommissioned 1950s). This one disappears in the 1955 state map. 23.72 mi. ; from Bus US 50 in Salisbury east to US 50 east of Berlin. MD 346 came into being sometime between 1963 and 1966, when the new 4-lane US 50 was built east of Salisbury. Routes 346-354 are in or close to Wicomico County. MD 347 · Quantico Rd. 6.92 mi. ; from MD 349 south of Quantico northeast to US 50 near Hebron. Marked, no cardinal directions, as is often the case on the Lower Shore. It would probably be a north-south. MD 348 · Laurel Rd. 1.39 mi. ; from Eagles Ave in Sharptown southeast to DE line. 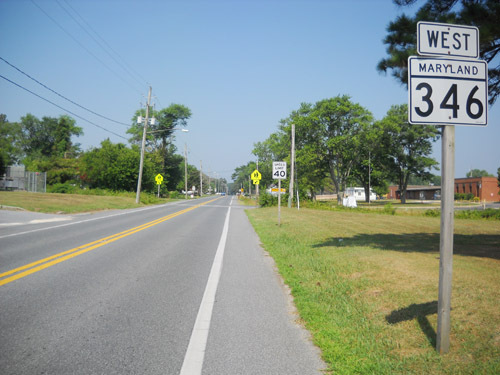 Also called Main St. west of MD 313 in Sharptown, Route 348 begins at that town's corporate limits, crosses the new MD 313 bypass, and quickly disappears into Delaware in less than a mile and a half. 22.32 mi. ; from road end east to US 50 Bus. Little or no change on this route since the 1930s, with exception of current 815 once being part of it near the eastern end. 11.80 mi. ; from begin of state maintenance east of Salisbury east to MD 354. 4.62 mi. ; from MD 180 south to end of state maintenance. Prior to the mid seventies, this was MD 78, after which it became part of MD 180. The current designation dates from 1988. The route still ends in the same spot just north of Church Hill. 1.77 miles; from Camden Avenue (former MD 663) to Little Brown Rd. Status: Decommissioned 1955, transferred to Wicomico County maintenance. (SHA Min. 11-23-1955, Effective 11-23-1955). This appears to be the original 351 that would have fit into the clustering system. Dropped in 1955 along with a slew of other routes in the area. MD 513 now parallels the road a few blocks northeast, the new US 13 overpasses with no access. MD 351 south of Salisbury on the 1939 MD official map. MD 663 would have been Camden Ave. MD 529 still exists further south near Princess Anne. Only mention of this 351 is in a 1937 operating budget. Perhaps a typo for MD 357. 10.03 mi. ; from MD 349 south then northeast back to MD 349. 4.60 mi. ; from MD 346 north to MD/DE 54, DE line. 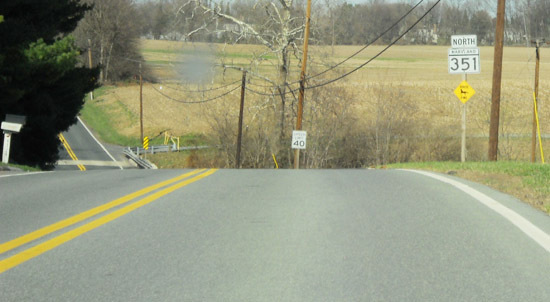 MD 353 does not begin at US 50 as many think (it should), but where it always has, at the old US 50, now MD 346. At US 50 the signs read "TO MD 353." 14.98 mi. ; from US 50 south to MD 12. 41.04 mi. ; from US 15 north of Frederick south to DC line. MD 355 is the original routing of US 240, prior to construction of Washington National Pike (current I-270) in stages beginning in the early 1950s. As sections were completed, the routing of US 240 was moved over to sections then open, and the old sections designated MD 355. The interchange with I-70 was removed in 2009, replaced with an interchange further east, with the extended MD 85. The northern terminus was also rolled back to I-70 south of Frederick in that year, although 355 signage remains in Frederick for the time being. New construction in Urbana resulted in the eastward rerouting of MD 355 in 2009, with the opening of the new Worthington Blvd, which crosses, but is mostly north of, MD 80. The original Urbana Pike was signed as Business MD 355 at its northern end. It has been touted as a bypass, but is more of a thruway, as new subdivisions and retail will line the new road. This project also includes the dualization of MD 80 east of I-270 in Urbana and in the vicinity of the new MD 355. A 1937 SRC document describes MD 355 as "0.1 mile in the vicinity of Crisfield." Routes 356-364 are clustered in Somerset County, with 356-360 all along the 413 corridor near Crisfield. small piece east off MD 413. No longer assigned (decommissioned c. 1990). A short route near Marion, straddling either side of MD 413. 1.13 mi. ; N off 413 to Janes Island State Park. A small piece of MD 358 remains north off MD 413. Once extended south through Crisfield along Somerset Ave as well. The part in Crisfield was turned over to municipal maintenance in 1956. 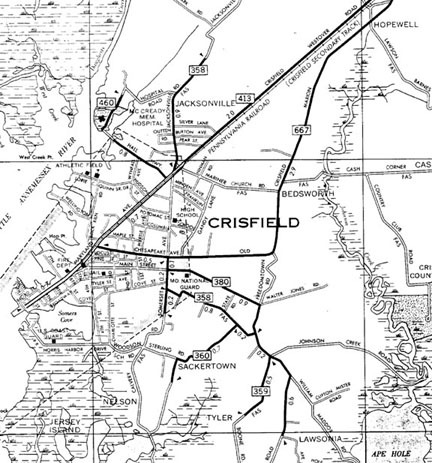 All routes south of Crisfield except MD 380 (which remains) was dropped by 1973. The map from 1967 says it all. The piece that remains today was once numbered MD 475. Sometime between the 1940-46 map editions (in the wartime period when no maps were printed), MD 358 took over this portion. From 1956-1973, MD 358 was a split route, when the (original) southern portion was dropped. Crisfield area showing MD 358, 359, 360 from SHA map, 1967. 0.20 mi. ; from MD 756 south to dead end near US 113. Signed north-south, but only at north end (MD 756). So named as it was the first bypass of US 113, which had originally used current MD 756. Dead-ends now as it was itself bypassed to the east by the current US 113. MD 359 now dead-ends at the American Legion hall on the corner of US 13 and 113. Connection is made with 113 a few hundred yards to the north via MD 359B, American Legion Dr.
MD 359A: Olds Rd 0.14 mi. ; from MD 756 north to road end. Possibly an old alignment, this segment lies completely north of MD 756. MD 359B: American Legion Dr 0.06 mi. ; from MD 359 east to US 113. No longer assigned (decommissioned 1968). SHA records don't record the name for this road when it was dropped in 1968.